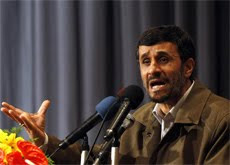 Iran's President Mahmoud Ahmadinejad has ordered the replacement of the US dollar by the euro in calculating the value of the country's Oil Stabilisation Fund (OSF). The edict, issued on Sept 12, follows a recommendation by the trustees of the country's foreign reserves, Iran's English-language daily The Tehran Times said on Monday, citing Iran's semi-official Mehr News Agency. The move was taken because the government wishes to protect itself from the fragility of the US economy and the weak dollar. The OSF, which forms part of Iran’s foreign exchange reserves, is a contingency fund set aside to cushion the economy against fluctuating international oil prices. It is also used to help both the public and private sectors with their hard currency needs by extending loans. Press TV meanwhile reported that following the switch the interest rate for facilities provided from the foreign exchange reserves is to be cut to 5 percent from 12 percent. Since its introduction in 1999 by the EU the euro has gained popularity internationally and there are now more euros in circulation than the dollar.